From left: Saleem Janmohamed, Accenture; Andy Grove, Ben Horowitz and Geoffrey Moore, M.C. Andy Grove was a founder, CEO and Chairman of Intel during a long career that saw the Silicon Valley firm grow to become the world's largest chip maker. 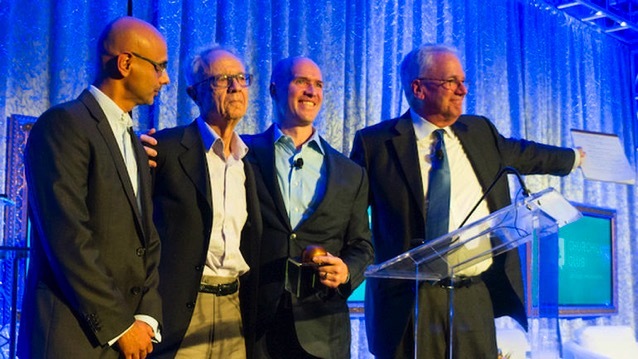 Andy Grove, the former CEO and Chairman of Intel, was honored late last week with the "Legendary Leader" Churchill Award from The Churchill Club, a long running Silicon Valley technology forum. His award was accepted by Ben Horowitz, a VC who was impressed with Grove's 1983 book "High Output Management.". There was also a video recording of Silicon Valley executives such as Mark Zuckerberg praising Grove. A very frail looking Grove, 79 years old, took to the stage to thank everyone and spoke briefly. Grove is credited with building a tough talking and hard working culture at Intel that propelled the company from a failing memory chip maker to a microprocessor manufacturer that dominates desktop and server markets. Grove escaped from Hungary to the US after surviving the German occupation of the Second World War and then the Hungarian revolution against the communist government and invasion by Soviet forces in 1956. His migrant status was mentioned by Horowitz in regards to closed borders and the migrant crisis in Europe and in the US, which would likely have kept Grove out.